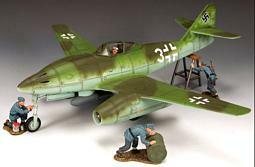 King & Country – WWII – German Luftwaffe – Arriving this week! To begin the New Year King & Country introducing the latest “Warbird”, the revolutionary Messerschmitt 262, the world’s first jet-powered fighter aircraft. Plus, some extra Luftwaffe pilot and ground crew figures. LW036 — Adolph Galland’s Me.262 – In March 1945 General Der Jagdflieger Adolph Galland was tasked to form a brand-new fighter unit, JV44 that would fly the Me262. Originally conceived as a “pure fighter” the design and concept had been altered by Hitler himself to become a “fighter/bomber”… Ace pilots like Galland (104 “kills”) were aghast but had no choice in the matter… They were expected to be able to take on the British, American and Russians as “fighters” one day and “fighter bombers” the next.This model shows Galland in “White Three” with two 500kg.bombs slung under the forward fuselage. This is the biggest and heaviest “Warbird” yet! Just 600 are being produced. 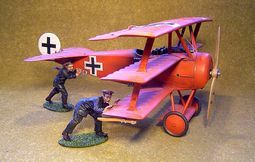 LW037 — Luftwaffe Ground Crew – Three very useful Luftwaffe support staff that can be used to perform a wide variety of different airfield tasks. LW038 — Major Rudolf “Rudi” Sinner – “Rudi” Sinner originally flew with Marseille in North Africa and achieved 39 confirmed victories, including two flying the Me.262. LW039 — “Coffee Break” – Two more enjoy some ersatz coffee… after a mission… Oberfeldwebel Heinz Arnold (42 “kills”) and Unteroffizier Edouard Schallmoser who gained a dubious reputation as a “Rammjager” for his dangerous habit of deliberately ramming enemy aircraft… with his own. He did not survive the war. LW040 — Hauptmann Anton “Toni” Hackl – “Toni” Hackl is on telephone duty waiting for the call to “scramble”. Hackl is credited with 192 enemy aircraft and was himself shot down 8 times. LW041A — Major Walter “Nowi” Novotny – “Nowi” Novotny was one of Germany’s top air aces with a staggering 258 “kills” to his credit. At the end of the war he also commanded his own 262 squadron. LW041B — Major Heinz Bar – Earlier in mid 2010 K&C featured Heinz Bar flying his Focke Wulf 190. This new seated figures shows him relaxing prior to a combat mission. Of his wartime “tally” of 220 “kills” Heinz Bar shot down 16 while flying a 262. LW042 — Galland’s Crew Chief – Leaning over the cockpit of the 262 is Galland’s personal crew chief making sure everything and everyone is ready to fly. The Nieuport 17 entered service in 1916 and became a mainstay of Allied squadrons during the first world war. It was manufactured by Nieuport — a French aircraft manufacturer. The type was designed by one of Frances’s greatest aviation pioneers, Edouard de Nieuport. 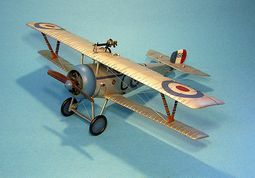 The Nieuport 17 could be equipped with the synchronization gear that would allow a front-mounted Vickers machine gun to fire between the spinning propeller blades without shooting them off. However, the British preferred the Lewis gun, which had to be mounted on the upper wing, to fire overtop of the propeller. Mounted directly in front of the pilot’s vision is an Aldis sight for the upper wing Lewis gun. In 1917, Canadian fighter ace Billy Bishop flew his Nieuport 17 in combat against German pilots, including an engagement with Manfred von Richthofen — the infamous “Red Baron”. After he shot down his fifth plane, the ground crew produced a can of blue paint and gave his plane the distinctive blue nose, despite the regulation against customized paint schemes. Bishop shot down 72 enemy aircraft and earned the Victoria Cross, Distinguished Service Order and Bar, Military Cross, and Distinguished Flying Cross. GGC-001 — German Ground Crew – 2 Figures Moving a Fokker. There has been a delay in the Red Baron Set, the good news is you can look forward to it in April. A military chaplain is a chaplain who ministers to soldiers, and other members of the military. In many countries, chaplains also minister to the family members of military personnel, to civilian noncombatants working for military organizations and to civilians within the military organization’s area of operations. Philip Hughes was officially listed as the Chaplain for the 44th Regiment of foot, during the Braddock expedition. The following is an extract of a letter from Fort Cumberland, dated July 23, which appears in The Public Advertiser, October 31, 1755.
cut 350 thro’ Woods, for the last 200 saw no House but this dirty Fort. sold to Sir Peter Halket and our Mess at 3.*. (* – a pound sign I assume. A special thank-you to Darrell Pace for the suggestion and information on Chaplain Hughes. The advance guard of Braddocks expedition consisted of 100 grenadiers of the 44th, under Lieut. Colonel the Hon. Thomas Gage. It was followed by a party of axemen, two field guns, with ammunition wagons and their guard. The advance guard had just crossed a wooded ravine eight miles from the fort, when the scouts suddenly fell back. They had sighted a figure hurrying along the path, dressed as an Indian, but with an officer’s gorget. It turned out to be the French commander, Beaujeu, who had just disposed his tiny force of 900 in semi-circular formation, with the French in the centre, hidden from view by the trees and inequalities of the ground. It comprised Regulars, Canadians and Indians, of whom the last- numbered 650. 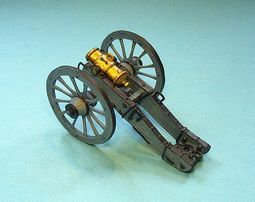 Their opening fire caused severe loss to Gage’s men, who, however, wheeled into line and commenced volley firing, which killed the French commander. Although the French were temporarily checked by three rounds of grape and canister from the guns and by the spirited advance of the British main body, shouting “God save the King,” there was considerable confusion caused by crowding from behind, and several men in the front were afterwards found to have been killed by fire from their comrades in the rear. 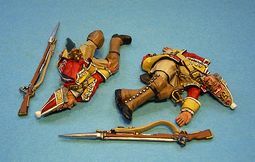 By this time all the grenadiers had fallen save eleven and the survivors utilized a prone tree as a breastwork, from which they maintained an effective fire. This will be the last set for the “Return To Monongahela” series. Additional sets will still be released through the Collectors’ Club. 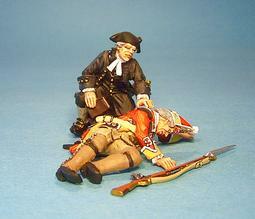 The Grenadiers were the elite shock troops of the regiment. Their special headdress was to differentiate them from the regular “bonnet” companies. The high grenadier bearskin cap made them look taller and more imposing. 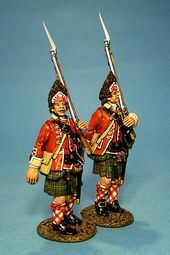 The grenadier name derived from the function they had used to perform in the seventeenth century, which was throwing hand grenades prior to a final assault on a defensive position. Army commanders would customarily organize the regimental grenadier companies into a special assault battalion which were then used to spearhead attacks on critical vital points. At Ticonderoga the grenadier companies from the 42nd, were converged with 5 other Grenadier companies into one unit, and were under the command of Lieutenant-Colonel Frederick Haldiman of the 60th Foot. TIC-020 — 42nd Regiment of Foot – 2 Grenadiers Marching. There were 2 x 5.5″ Howitzers at Chippawa. It took 2-3 trained gunners , with 3-4 assistants to operate. The rate of fire was 1 round per minute, and effective range was 600-800 yds. 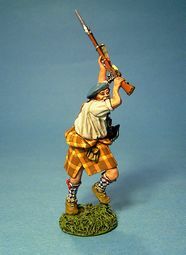 There are now 26 Highland figures in this series. There will be no more Highlanders for a while, as I take a short break. 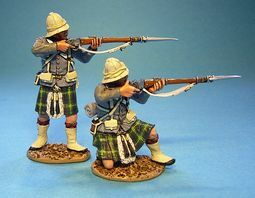 There will be 2-3 more sets of Gordon Highlanders from May 2011, which will be subject to the price increase.